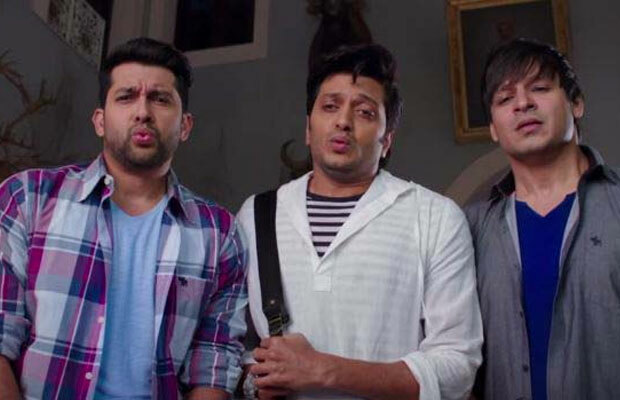 [tps_footer]The adult comedy ‘Great Grand Masti’ opened on a low note at the box office. The film starring Vivek Oberoi, Riteish Deshmukh, Aftab Shivdasani and Urvashi Rautela in lead roles has not received a good response at the box office. The movie is the third part of the Masti franchise. Unlike, the prequels, ‘Great Grand Masti’ could not show any colors in the collections. The film is much in the losses because of its online leak prior to its release date. The adult comedy flick got leaked online and even after blocking the major sites the movie was illegally downloaded by many. This leak further resulted in low box office earnings. The release date of the film was preponed owing to the leak. The Riteish Deshmukh starrer opened on an average note of 15% to 20% on its first day. The previous two parts of the film ‘Masti’ and ‘Grand Masti’ collected laurels at the box office. Moreover, with the successful run of Salman Khan’s ‘Sultan’, the adult comedy further had to face lack of audiences. The Indra Kumar helmed film has completed its first weekend at the box office. The collections of the film are Rs. 2.50 crore net approx. on Friday, Rs. 2.50 crore net approx. on Saturday and Rs. 3.25 crore net approx. on Sunday. The total first weekend collection of the movie comes to Rs. 8.25 crore net approx. Previous articleCheck Out: Qandeel Baloch’s Last Tweet About Salman Khan’s Bigg Boss 10! Next articleHere Are The Top Nominations For The Indian Film Festival 2016!